… so far from Christianity failing, only Man has failed to remain faithful to those Truths which Christianity revealed. But God in his great wisdom has provided Man with free will by which he can repent of past mistakes and make a fresh start. 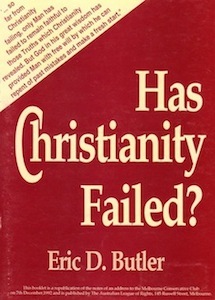 Eric D. Butler said: While there is a Christian philosophy, Christianity is not primarily a philosophy, nor is it merely an ethical system; it claims to be a revelation of Truth. C.H. Douglas has said that "Christianity is either of the warp and woof of the universe, or is merely another set of interesting opinions". He warned that unless there were major alterations to a financial system being used to misdirect the economic system from its purpose of serving the individual customer, Western Civilisation was going to disintegrate into a new Dark Age.